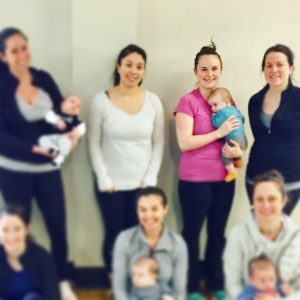 In January Active Moms’ Club kicked-off our second 60-Days of YOU! Fitness & Nutrition program. The goal of the program— to help moms focus on their own self-care. One of our newest members, Lauren, made an incredible transformation to her body, while increasing her energy, strength and confidence. Lauren first came to AMC last year for our Postnatal Recovery Class. She was eager to safely return to exercise and to rebuild her strength post baby. As every mom knows the first year of motherhood is a big transition. 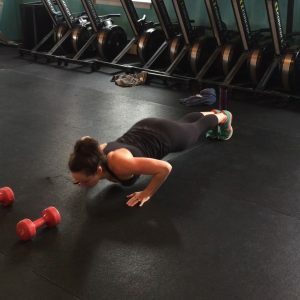 Lauren’s son turned one on December 24 and was struggling to find her fitness groove. 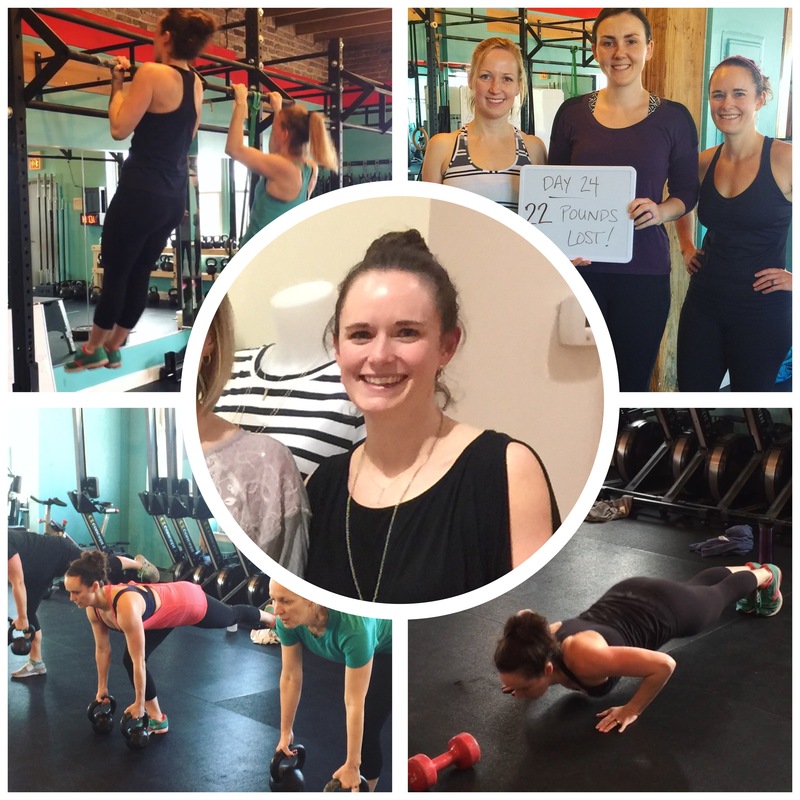 “I wanted to get more energy, get back into the routine of regular exercise, and fit into my pre-pregnancy clothes”. When 60-Days of YOU! Fitness & Nutrition program came around in January, she knew the time was right to make a change! AMC’s 60-Days of YOU! program is eight weeks of fitness and nutrition guidance that has helps take the guesswork out of slimming down, getting fit and establishing a healthy relationship with food and exercise. All 21 of our moms who participated in our winter program reaped the benefits of having two personal coaches to help them create a map to new healthy habits and a strategy to make them stick. Lauren lost 10 POUNDS during the 60-day program! More noticeable, she lost FOUR inches around her hips allowing her to fit back into pre-pregnancy clothes with ease. Our abdomen and hips in particular, show if an individual is estrogen-dominant. Estrogen dominance leads to weight and/or fat gain, thyroid dysfunction, mood swings, sluggish metabolism, fatigue, trouble sleeping/insomnia and many other symptoms…(sound familiar to you?). As moms, we have raging hormones! 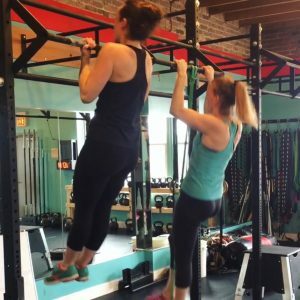 Moms are learning to rebalance our hormonal environment through nutrition—and AMC’s high-intensity strength training workouts are the perfect pair to increase growth hormones and burn fat. 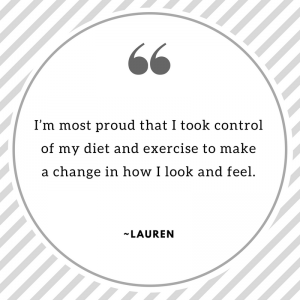 Lauren’s dedication to her fitness and nutrition continues the shift in her hormonal environment, and the rewards are priceless! I see more muscle definition and feel strong and healthy. I like the variation and pace of Fit & Fab Small Group Training sessions. I felt like I got a great workout without feeling miserable throughout it. It left me feeling motivated to exercise at home and come back every week. I really like using kettlebells, they make me feel very strong. I’m most proud that I took control of my diet and exercise to make a change in how I look and feel. Of course, I’m very proud of losing weight and feeling comfortable in my clothes! Lauren’s journey is impressive. She demonstrates that determination and dedication will pay off. One mom lost a whopping 14 pounds! What are your personal fitness goals? Rather than wish for change, take action! No exercise experience is required to start our Fit & Fab strength training program. Likewise, AMC can take your fitness to a whole new level. Let the power of small group training move you! Join us for a one-time Fit & Fab test-drive for just $25. Experience a session for yourself and you too will be on your way to feeling more confident about what your post-baby body can do. Do your food choices and workout routine feel like a guessing game? Do you vision a slimmer, healthier, fitter version of yourself this summer? Are you ready for a life changing experience? —Yes.